‘Simon Peter – Sifted as Wheat’ examines the sad episode of Peter’s denial of the Lord. “ Simon, Simon,” the Lord says, “behold, Satan hath desired to have you, that he may sift you as wheat; but I have prayed for thee, that thy faith fail not; and when thou art converted (restored), strengthen thy brethren”. Simon got his warning here; if he had only taken heed to it, what a different sequel would have been recorded! If he had only been chaff, and not really “wheat,” Satan would not have wanted to sift him: it was because he was the real wheat that Satan desired to get him in his power. Satan does not tempt an unconverted person, he tempts a child of God, but he governs and controls entirely the unconverted — drives them before him at his will. When Jesus was arrested “they all forsook Him and fled.” Afterward we see Peter following “afar off,” and then again we see him in the high priest’s hall, where there was a fire, and he warms himself by it. What steps we see in Peter’s downward course, leading to his denial of the Lord he loved! First, declaring he was ready to die for Him, although the Lord had just told him that Satan was desiring to have him, and that He was praying for him; next, sleeping when he should have been watching; then fighting when he should have been quiet; then following afar off when he should have been near; and now sitting down, side by aide, with the enemies of Christ, and warming himself. With such a prelude one can only expect what followed - Peter denied with oaths and cursings that he had ever known the Lord. The only path of safety therefore is found in keeping as near to the Lord as we can, and as far away as possible from all that savours of the world. The moral lessons for each of us from this sad episode in Peter’s history are many and plain. It should teach us to walk softly, prayerfully, and ever keep near to the Lord. 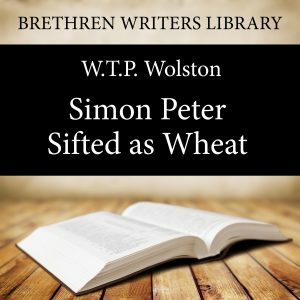 ‘Simon Peter – sifted as Wheat’ is part of the author’s excellent book ‘Simon Peter – his life and letters’. A word about the Author: Walter Thomas Prideaux Wolston (1840-1917) was born in, Devon, England. He began as a lawyer and later he established himself as a physician in Edinburgh. He dearly loved the Gospel, and it mattered not what subject he discoursed upon to Christians, he never finished without preaching God's salvation. He also wrote books on spiritual subjects, which have been helpful to many, including: "Young Men of Scripture", "Night Scenes of Scripture", "Behold the Bridegroom", and "The Church". So that by means of the printed page Dr. Wolston has been, through the grace of God, a means of blessing to thousands of both saints and sinners.